Why Playground mulch for your school or organization? Playground Mulch (also known as engineered wood fiber, wood rug, or Woodcarpet®) is a ground wood product similar in texture to shredded bark mulch. But our mulch is made out of the woody part of the tree (not bark), so it is light in color. 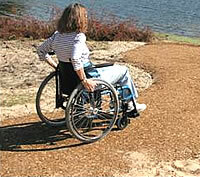 When it gets compressed, our mulch produces a surface that is considered wheelchair accessible and ADA compliant.Our mulch is certified and meets ASTM standards. Nationally we deliver playground mulch in loads of 90+ cubic yards in any of the 48 continental states. Prices vary from state to state. 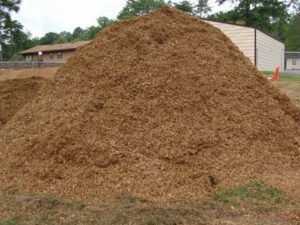 In Washington DC and the surrounding areas of Maryland and Virginia, we deliver and/or install our mulch in quantities of 8 cubic yards or more. We also sell our playground mulch to go, in any quantity, at our facility in Boyds, Maryland. Note: Sales of playground mulch to go are done by appointment only. To make an appointment to pick up our mulch, just phone us at 301-840-0707. For more about our local services, including playground mulch delivered to Washington DC, Maryland or Northern Virginia, visit our local website Capital Area Playground Services. 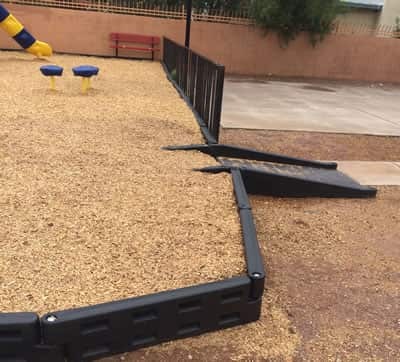 Resilient surfacing (including mulch) should be placed around stationary playground equipment at a 6 foot or greater radius, more at the end of slides. Swings need resilient surfacing (including playground mulch) to a distance of twice the height of the swing beam in front and behind the swing, plus the normal 6 ft at the ends. A swing with an 8 ft high swing beam would, therefore, need 16 feet clear in front and behind, for a total of 32 feet in the direction of the swing path (including mulch).